The Ozark region is a great place where you can find some of the best Branson outdoors including the beautiful Table Rock Lake. 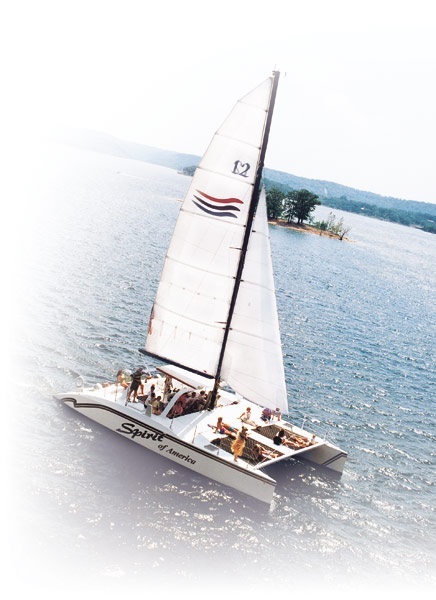 If you want to feel the gentle breeze and see the clean and crystal waters of Table Rock Lake, get onboard with the 48-foot sailing catamaran, The Spirit of America. The 49-passenger sailing catamaran sets sail every day at noon and 2:00 pm right from the State Park Marina. The catamaran operates a sailing cruise, a Water World Adventure Cruise, and a Sunset Celebration Cruise. Whatever kind of lake cruise you choose, the catamaran drops anchor after it reaches the destination, and so the passengers can get in the water. Now the water adventure begins. As the fun is about to start, you can choose to play, get a nice tan or simply relax. The catamaran is tugging many different kinds of water toys/activities such as kayaks, a water trampoline, a blob, and a 20+ ft. inflatable water slide. So you have many options for your thrilling water adventure. If you opted for a sailing cruise, it can be a fun and exciting as you set sail with the Spirit of America. Here you will get the chance to see crewmates and passengers lift the prop and hoist the sails, then kick back and relax for a 90-minute excursion on the pristine Table Rock Lake. The Spirit of America can accommodate big groups and private charters for any occasion. The State Park Marina where the sailing catamaran is based, offers a variety of sizes and styles of boats for rent, ski’s, all kinds of tubes, and accessories you need for your water activities. You can also find sunscreen, apparel, fuel, bait, tackle, snacks and more. Aside from the main attraction of the Spirit of America, State Park Marina also offers parasailing, scuba diving, and guided fishing. State Park Marina has got everything for any type of water enthusiast that include wave runners, boat rentals, scuba diving, and bass fishing. State Park Marina has a store that offers sportswear, sports gear, boat supplies, bait and tackle, fuel, and food items. The well trained marina staff stands ready to guide you on your water adventure in the pristine waters of Table Rock Lake. The State Park Dive Shop at the State Park Marina offers a full-service dive facility located in the boathouse. State Park Marina also offers two-hour Discover Scuba Course which are only available to guests with prior diving experience. The Boathouse BBQ and Burgers Café in the park serves quality and fun foods such as barbecue, burgers, and hand-dipped ice cream treats. Spending a fun day on Table Rock Lake with your family creates an unforgettable memories that will last a lifetime and the State Park Marina can help you create those memories. Table Rock Lake is one of the most visited Branson outdoors in the Ozark region as it offers an array of fun activities including a sailing cruise with a 48 ft. sailing catamaran, The Spirit of America.